England honors its dead on the second Sunday in November. America’s day of remembrance, Veterans Day, is always November 11. I was surprised this year to see no poppies sold locally. We have a strong American Legion presence in the community, but if they were selling poppies this year, I regretfully missed buying one. It was Lieutenant Colonel John McCrae (1872-1918) a Canadian military physician during World War I, who wrote “In Flanders Fields” and initiated the poppy custom. The red poppy – a visible reminder of the bloodshed of trench warfare. The second stanza of “In Flanders Fields” says it best: We are the dead. Short days ago / We lived, felt dawn, saw sunset glow / Loved and were loved, and now we lie / in Flanders fields. Seeing a mass assemblage of graves in a military cemetery is a sobering experience. When we lived in London, I always visited Westminster Abbey where prior to Remembrance Sunday, volunteers plant small wooden crosses, each with the name of a soldier killed in battle. November’s twilight days /bring Death’s cold breath closer. / His eyes hold no warmth. /Remembrance Sunday /brings death home. Time, /blown by gale force winds, /rushes past to a cadence sung /by an unseen drill sergeant. 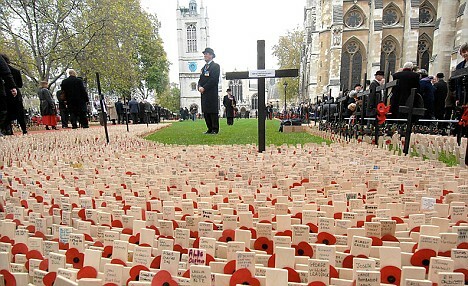 /Red crepe-paper poppies /and wooden crosses stand /attention tall, chin-up, /shoulder-to-shoulder / in regimental plots. / At the base of Westminster Abbey, /mock graves honor / The Light Dragoons, / The Royal Fusiliers, / and the Queens Royal Lancers. Geoff died the next day. I have spent the last few days reading the WW I poets: Philip Larkin, Wilfred Owen, and Siegfried Sassoon. I didn’t know Wilfred Gibson (1878-1962) but his poem “Back” spoke to me. It is an old poem, but as our traumatized soldiers return from Iraq and Afghanistan, it rings as true today as yesterday. They ask me where I’ve been, / And what I’ve done and seen. / But what can I reply / Who know it wasn’t I, / But someone just like me, / Who went across the sea / And with my head and hands / Killed men in foreign lands… Though I must bear the blame, Because he bore my name. If you haven’t read Dalton Trumbo‘s Johnny Got His Gun, read it, you won’t be disappointed. I’ve always wanted to adapt it to a anti-war, Readers Theatre piece, but my plans are more ambitious than realistic. Try inventing correspondence between someone on the front lines and someone at home. Talk to someone about their war experiences. Perhaps they’ll give you details or a story that you can use in a poem or short story. This entry was posted in Uncategorized and tagged Philip Larkin, Remembrance Sunday, Siegfried Sassoon, Veterans' Day, Wilfred Gibson, Wilfred Owen. Bookmark the permalink. Poignant. As I remember, your father was a veteran as was my brother, and now my son. Maybe we should explore those stories. To the day he died, my dad regreted that as a drill sergeant, he was “stuck” stateside and didn’t have the opportunity to serve in the field. He would have liked to be in the heat of battle. Patriotism played a part – he enlisted the day following Pearl Harbor. But knowing my dad – some of his desire was to prove himself worthy under fire.